Boasting a 1.5 times brighter LED than the original Knog Frog, the new Knog Frog light using the Nichia® Ultra-Bright LED is in stock and ready for shipment at Persons-Majestic. 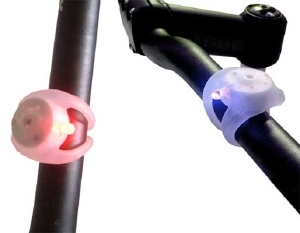 The Knog Frog's unique design allows the light to be clipped onto practically any part of a bicycle including the handlebars, seat post and bike frame. The light will burn for up to 360 continuous hours on one set of coin cell batteries and features both a steady and flashing mode. Weight is a miniscule 12 grams. The new Knog Frog using the Nichia® Ultra-Bright LED is available in white only and carries an MSRP of $11.98 for the single light and $21.95 for the twin pack. Persons-Majestic also stocks the original Knog Frog lights in red and blue. "Knog continues to innovate," says Charlie Persons, president of Persons-Majestic. "The new Frog light is another example of the company's commitment to excellence. Dealers are going to be really happy with this light." Persons-Majestic also has in good supply Knog shoes, bags and clothing. For a catalog and new price list, dealers should contact Persons-Majestic at 1-800-772-2453 or e-mail permaco@aol.com.